As a political commentator in the run-up to tomorrow’s election, Mayor Stephanie Rawlings-Blake has been on national television discussing national issues – from the Democrats’ get-out-the-vote effort (with Soledad O’Brien) to FBI director James Comey’s letter about Hillary Clinton’s emails (with George Stephanopolous). O’Brien also questioned Rawlings-Blake on a hometown matter that has become awkward for the lameduck-mayor-turned-talking-head: her banning of a member of the media from her weekly City Hall press availability. 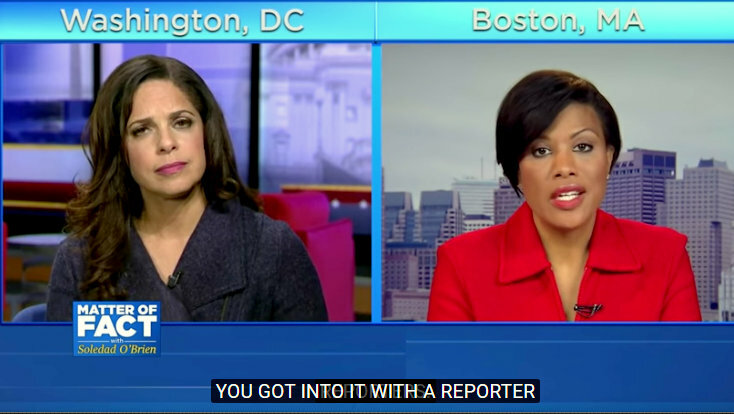 “You kind of got into it with a reporter who covers you and you’ve kicked him out of your press briefing,” O’Brien said at the end of a segment of her “Matter of Fact” show that was aired locally yesterday on WBAL-TV. Explaining her edict, Rawlings-Blake went on to repeat a claim that Burns has repeatedly denied publicly: that he acted in an abusive manner towards one of her staffers. “What I won’t tolerate is abusive behavior to my staff,” she said, noting that she has also defended a member of the media in a parallel situation. Burns’ fellow reporters in Baltimore have condemned the mayor’s action, as have the Baltimore Association of Black Journalists, the National Association of Black Journalists, the Maryland-Delaware-DC (MDDC) Press Association and the Society of Professional Journalists. Burns’ banishment, first disclosed by The Brew, followed an October 5 press briefing in which he asked the mayor whether the city would have to go to Annapolis to ask for policy changes in the Baltimore Police Department. Rawlings-Blake told him she did not follow his question and “I’m not going to understand it right now.” She promised that her office would follow up with an answer, but Burns continued to press her. “Those are too close quarters for someone who has demonstrated abusive behavior,” Rawlings-Blake repeated. Although Burns does not appear in the segment, O’Brien’s staff did contact him for comment.